A CAIS trainee has hailed a “life-changing” employment project after it helped him land his first paid job. James Dakin loves his new role leading pony and tractor rides at major tourist attraction and event venue Bodafon Farm Park in Llandudno. 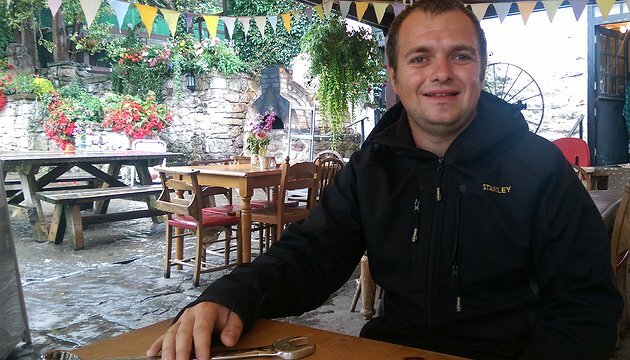 He was able seize the opportunity after spending six months boosting his prospects through the EU-funded At-Your-Service catering and hospitality programme at Porter’s Coffee Shop and Bistro in Colwyn Bay. James said he was “really enjoying” his new post – which he took up at the start of the summer season in late May. “Wendy from At-Your-Service told me that Bodafon wanted me to come and meet them, so I did,” he said. “I got a trial for two weeks and I’ve been here ever since. 26-year-old James has been working hard during the busy summer period, but enjoys keeping busy and collecting a regular wage. He reckons the skills and confidence he developed during his time on the At-Your-Service programme have been vital to success in his new job. “The customer service experience really helped me because you are working with the public here every day,” James said. At-Your-Service is designed to help deliver economic growth and jobs, build a thriving and prosperous economy, boost skills, and help people into work. It includes practical experience, accredited qualifications and training, and one-on-one job-hunting and employment support for overs-25s who want to take their first steps towards a rewarding career in catering and hospitality, or other customer service roles. Paid places offer around 22 hours per week at the national living wage for the duration of the 16- or 26-week programme. Courses delivered include health and safety in the workplace, emergency first aid and food safety in catering. The project – which is supported by the European Social Fund through the Welsh Government, and is part of the Active Inclusion Fund managed by WCVA – is designed to benefit the long-term unemployed and those who have work-limiting health conditions. Participants must live within the Conwy council area and meet specific criteria. Project manager Claire Jones urged those looking for work to consider the benefits. “At-Your-Service could be a genuinely life-changing experience,” she said. “So far, five of the eight participants to access the programme have already gained rewarding employment – with the other three still accessing training and work experience. Only a limited number of places remain! Learn more about At-Your-Service by clicking here or calling Claire Jones on 07795 484 115.